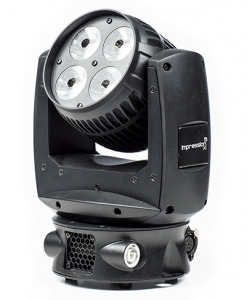 The impression X1 differs from other products in GLP’s X range, by featuring 4 high powered, 15 Watt, RGBW LED’s with a narrow fixed beam output that offers continuous pan and tilt motion, in a very compact housing. Just foot tall! The fixed beam optics are interchangeable between different beam angles from the standard 7°. The compact base of the impression X1 houses Neutrik Powercon in and thru connectors for easy daisy chaining of multiple fixtures, whilst the power supply is fully auto sensing from 100-240 V, 50/60 Hz.